I think that when you find a way to organize your stuff that works and feels right for you, it can make scrapbooking/art projects easier and more enjoyable. Then you spend time creating, not looking for supplies. This week I thought I would share some ways I like to store my ribbons. I love ribbon and I like being able to see them. That way when you need a color you are not digging for it. I do not like my ribbon to be wrinkled, which is what happened when I had it wrapped around bobbin winders and filed in a box. I had seen a product similar to this but decided to make my own. I used paper bobbin winders. 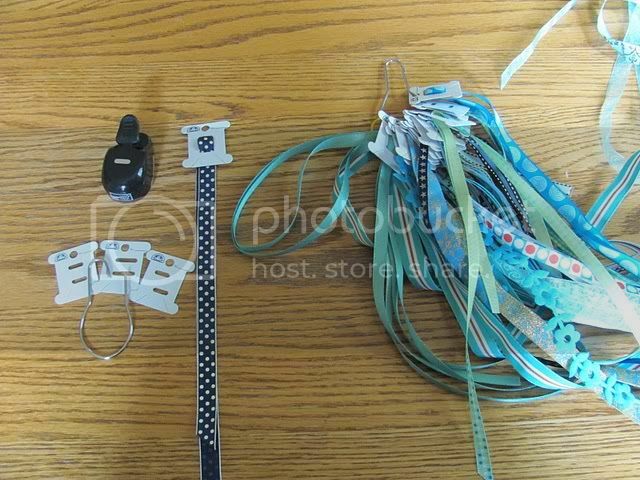 (Michaels or Walmart has these near embroidery thread), a slot punch, shower curtain rings (from Walmart). 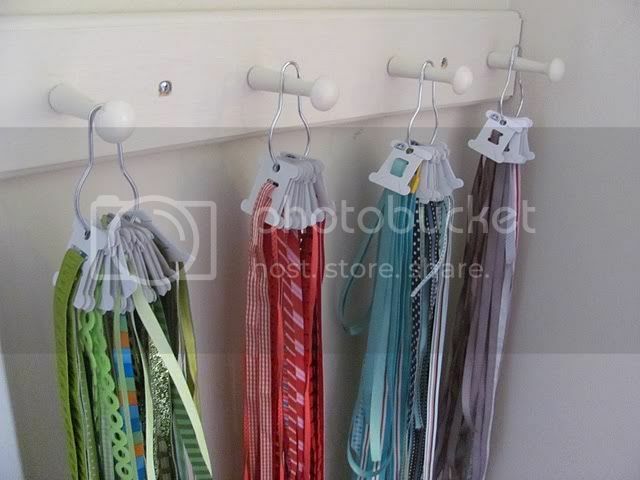 I used the slot paper punch (from Stampin'-Up) to punch holes at the top and bottom of the bobbin winder, then I slipped my ribbon through the bobbin winders and hooked them (organized by color) onto the shower curtain rings. It also looks great on the wall of your room. The other way I have some ribbons organized is to store them in buckets (these buckets I picked up at Dollarama). I stored the ribbons this way because they do not fit into to the "by color" or rainbow method of organizing. 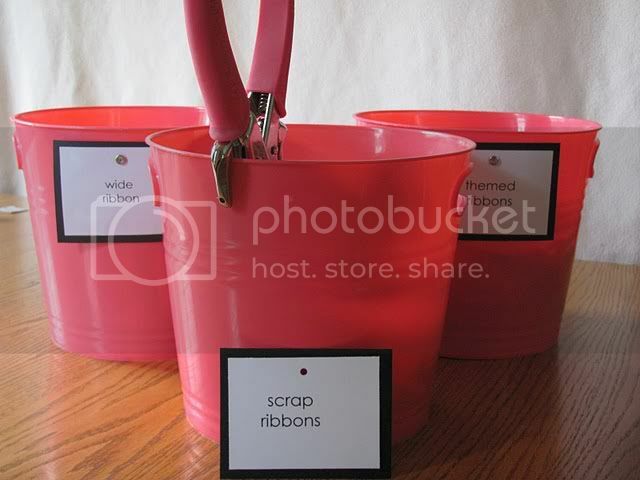 I have three ribbon buckets. They are marked scrap ribbons, themed ribbons, wide ribbons. Scrap ribbons are very small pieces, themed ribbons have a very specific theme that you can't use for anything else, and wide ribbons are ribbons I would probably use more for wrapping. I hope that these ribbon storage and organizing ideas work for you! A great idea. I will certainly give this a try.